Are you fed up with your wallet becoming being too thick and bulky when you place even just a small amount of cash and cards inside? You will want to switch to the Wonder Wallet then. 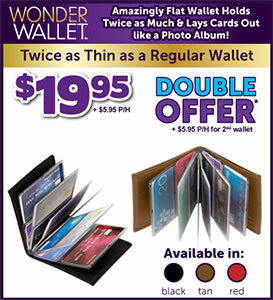 Wonder Wallet is a specially designed wallet that will allow you to store without becoming too bulky. The Wonder Wallet features specially designed pockets that allows you to store up to 8 credit cards inside without a substantial increase to the thickness of the wallet. This allows the wallet to be very convenient to bring inside your pocket or stored inside purses or handbags. The WonderWallet also features RFID protection so your information stored in your cards will remain protected while inside the wallet. With the Wonder Wallet, the manufacturer promises that you will have a wallet with a lot of storage options yet still remains compact and most importantly, secure.